PICO RIVERA >> A man showed up at a hospital with gunshot wounds after a drive-by shooting outside a Pico Rivera liquor store on Sunday afternoon, officials said. The shooting took place about 4:45 p.m. at Whittier Boulevard and Orange Street, in front of the Pico Market, Los Angeles County sheriff’s Lt. Noe Garcia said. “The suspects pulled up in the intersection and shot north into the liquor store parking lot,” he said. Deputies did not immediately find any victims at the scene, and potential witnesses appeared uncooperative. As the investigation continued, a known gang member in his 40s arrived at a Montebello emergency room with a gunshot wound to his leg, the lieutenant said. The injury was not considered life-threatening. The attackers were described only as two Latino men in a blue Volkswagen, which was last seen heading west on Whittier Boulevard. COVINA >> Police jailed an Azusa gang member late Friday after he ran from a traffic stop with large amounts of methamphetamine, cocaine and concentrated cannabis, as well as other people identifying documents, officials said. Steven Anthony Quintana, 42, of Azusa, who was already on felony probation for previous robbery conviction under the terms of AB 109, was ultimately booked on suspicion of possession of drugs for sales, possession of identity theft-related materials and resisting arrest, according to Covina police officials and Los Angeles County booking records. Quintana’s passenger, 37-year-old Darlene Denise Martinez, whose hometown was unclear, was booked on suspicion of possession of drugs for sales and possession of identity-theft related materials. An officer first tried to pull Quintana over for a traffic violation about 6:30 p.m., Covina police Sgt. Antonio Zavala said. After a delay, Quintana pulled over in the 5300 block of Cedarglen Drive, where he ran from the car, the sergeant said. A police helicopter which was already overhead directed officers on the ground to Quintana, who was found in the area and arrested without a struggle, Zavala said. Quintana ditched his jacket while running from police, he said. Inside the jacket, police found 46 grams of methamphetamine, seven grams of cocaine and 32 grams of concentrated cannabis. Inside the car, police also found identifying documents in the names of other people. Quintana and Martinez were being held in lieu of $50,000 bail each pending their initial court appearances, records show. 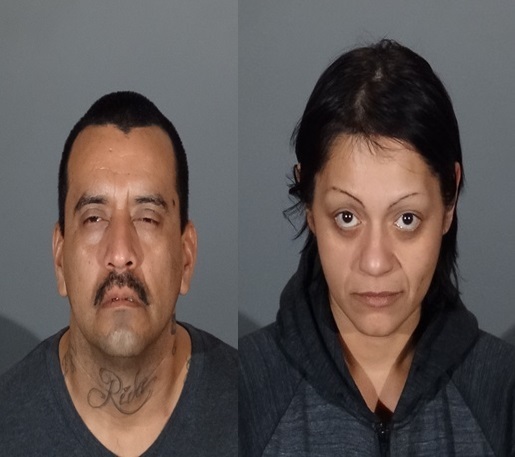 BOOKING PHOTOS of Steven Quintana and Darlene Martinez courtesy of the Covina Police Department. PASADENA >> Authorities have identified two Pasadena men who were shot to death while gathered at a vigil for another recent homicide victim in a suspected gang-related attack that also left two other people wounded late Friday. 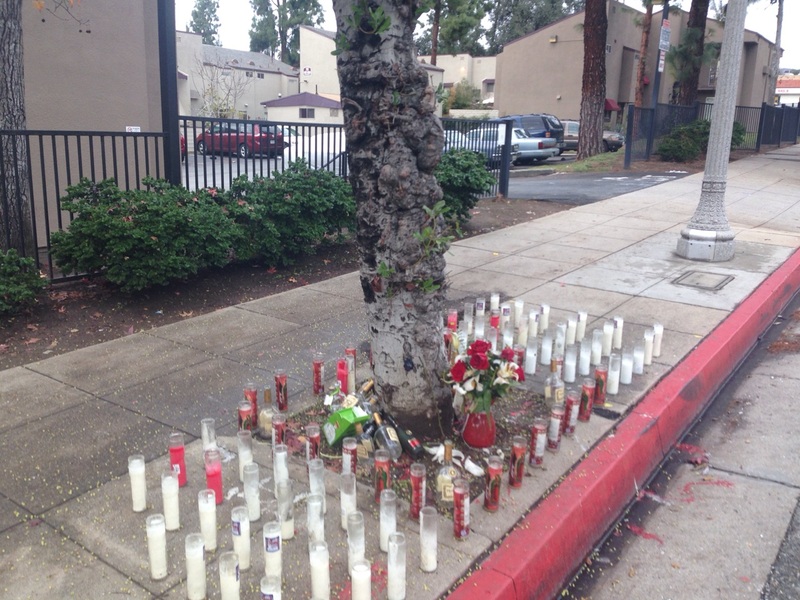 Antoine Dewayne Sutphen Jr. and Ormani Dajan Duncan, both 24 and from Pasadena, died following the late-night shooting near Fair Oaks Avenue and Claremont Street, Los Angeles County Department of Medical Examiner-Coroner Investigator Rudy Molano said. They were gathered at a vigil for another Pasadena man gunned down on the same spot on Dec. 22 when gunfire erupted from a passing car, Pasadena police Lt. Mark Goodman said. A woman was also critically wounded in the shooting, and a man suffered a non-life-threatening injuries. Hours later, gunfire again rang out on near the same corner about 5 p.m. Saturday, where a 25-year-old Pasadena man suffered a gunshot wound to his thigh, Goodman said. A lack of cooperative witnesses in all of the shootings left investigators with no solid suspect description, police said. The spate of violence was believed to be gang-related, Lt. Vasken Gourdikian said. SAN GABRIEL >> A man was stabbed, another was beaten and a car was struck by gunfire in a sudden spate of violence blamed on a gang rivalry late Wednesday, officials said. 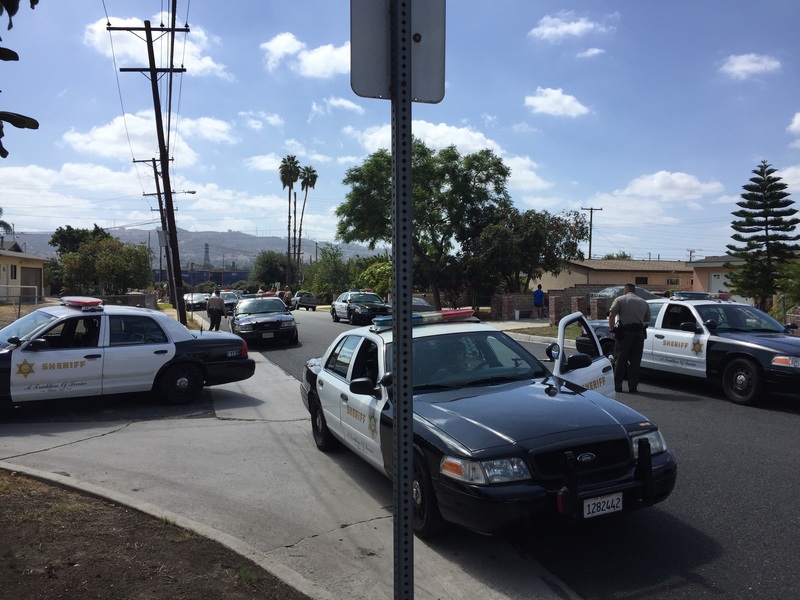 Police first received reports of a fight involving rival gang members about 1:30 p.m. in the area of Del Mar and Clary avenues, San Gabriel police Lt. Fabian Valdez said. The combatants had fled by the time officers arrived, the lieutenant said. But officials at nearby San Gabriel Valley Medical Center notified police about an hour-and-a-half later that a man in his 40s had arrived at the emergency room suffering from multiple stab wounds. Though conscious, the stabbing victim would not cooperate with investigators, Valdez said. Police were summoned to the same area about 8:20 p.m. after witnesses reported hearing gunshots at San Marino Avenue and Broadway, just around the corner from the scene of the earlier suspected gang fight, according to Valdez. Again, officers found no suspects or victims at the scene. A woman reported to police on Thursday morning that her husband had been beaten up by several other men, and her car had been struck by gunfire in incident at San Marino Avenue and Broadway, he said. The woman’s husband suffered cuts and bruises but no serious injuries. All three victims were in their 40s, officials said. Investigators believed the violence stemmed from a dispute between two groups of rival gang members. The stabbing victim is suspected to be affiliated with a local street gang, Valdez said. The victims of the beating and shooting were believed to have ties to a South Los Angeles gang, and the second incident appeared to have been carried out in retaliation for the stabbing hours earlier. “The San Gabriel Police Department is currently developing a plan to address this matter,” he said. Police asked the public to come forward with any relevant information. Any with information can reach San Gabriel police at 626-308-3838. Tips may also be submitted anonymously to L.A. Regional Crime Stoppers at 800-222-8477. LOS ANGELES >> Three gang members, including a “shot caller” who directed the gang on behalf of the Mexican Mafia, each received sentences of more than decade in prison stemming from a federal investigation targeting the El Monte Flores gang, authorities announced Friday. Mexican Mafia shot caller James “Chemo” Gutierrez, 53, and EMF gang member Kenneth Cofer, 37, were sentenced Thursday to 15 years in federal prison each, while co-defendant and fellow EMF member John Rivera, 54, was sentenced to 10 years and 10 months behind bars, U.S. Department of Justice Spokesman Thom Mrozek said in a written statement. “We now have secured lengthy prison terms for key members of one of the oldest street gangs in Los Angeles County after using the federal racketeering statute to dismantle the organization’s leadership structure,” according to U.S. Attorney for the Central District of California Eileen M. Decker. But the fight against gangs continues. Gutierrez and Cofer pleaded guilty in April to violating the federal Racketeer Influenced and Corrupt Organizations Act, conspiracy to distribute drugs and conspiracy to launder money in connection with a 61-count indictment targeting 41 EMF members first unsealed in 2014. Gutierrez served as a “shot caller,” directing activities of EMF at the behest of the Mexican Mafia. Gutierrez acknowledged in his plea that he regularly extorted “taxes” from drug dealers operating in EMF’s claimed territory, and had authorized an attack on a rival gang member, Mrozek said. Prosecutors noted he has a lengthy criminal history, including a racketeering-related murder convictions that resulted in a 20-year prison sentence. Gutierrez served a “pivotal role in the gang’s drug distribution, extortion, and violent activity,” according to the prosecution’ sentencing memorandum. Prosecutors described Gutierrez as the lead defendant in the case. In addition the RICO and conspiracy charges, Cofer also pleaded guilty to an additional charge of possession of a firearm in the furtherance of a drug trafficking crime, Mrozek said. Cofer admitted to managing and supervising the gang’s extortion and drug trafficking, including directing the use of violence on behalf of the gang, according to Mrozek. He admitted to authorizing the shooting of someone who had been involved in a dispute with a fellow gang member. Rivera pleaded guilty in December to conspiracy to violate the RICO Act and conspiracy distribute drugs. Thirty-one of the 41 gang members names in the 2014 indictment have pleaded guilty in connection with the case, Mrozek said. Prosecutors claimed EMF was holding meeting and selling drugs from the Boys & Girls Club on Mountain View Road, which was closed a month after the indictment against the gang was unsealed. In a related case, another EMF member, 30-year-old Christian “Bossy” Lafargo, was sentenced to 17-and-a-half years in federal prison in May after admitting to charges including conspiracy, attempted murder, conspiracy to commit murder, committing violent crime in aid of racketeering and discharging a firearm during and in relation to a crime of violence. LA PUENTE >> Deputies arrested a suspected gang member with a handgun following a pursuit through La Puente in a stolen car on Thursday afternoon, authorities said. A deputy patrolling in the area of Valley Boulevard and Ferrero Lane spotted a Toyota Camry which had been reported stolen in Baldwin Park earlier this month driving down the road, Los Angeles County sheriff’s Lt. Pete Cacheiro said. The driver refused to pull over, initiating a short chase along surface streets that ended when the driver abandoned the car and ran on nearby Wegman Drive, the lieutenant said. Deputies nabbed the suspect as he fled through a residential neighborhood, he added. He was arrested without further struggle. Retracing the suspect steps, deputies found a handgun, as well as a shirt and baseball cap the fleeing suspect had apparently discarded in an attempt to change his appearance, Cacheiro said. The identity of the suspect, a man estimated to be in his early-30s, was not released Thursday as detectives continued their investigation into the man, he added. The suspect was believed to have gang ties. 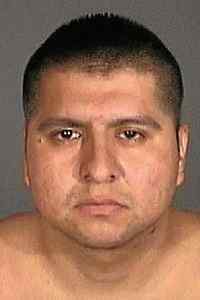 BALDWIN PARK >> An El Monte man already condemned to spend life behind bars received a new sentence of 86 years to life in state prison on Tuesday for the fatal shooting of a rival gang member on Christmas Eve in 2010, prosecutors said. Johnny Mata, 35, who has also been convicted of a second, non-fatal gang shooting in Baldwin Park in 2012, spent more than a year as a fugitive after he was accidentally released from jail in 2013 while awaiting trial, then recaptured in Mexico in Mexico. A jury Convicted Johnny Mata, 35, guilty last month of two felony counts of first-degree murder and possession of a firearm by a felon in the fatal shooting of 31-year-old David Deanda Jr., Los Angeles County District Attorney’s officials said. Jurors also found true the special, sentence-enhancing allegation that the killing was gang-related. Co-defendant Jesus Arroyo Lule, 35, pleaded “no contest” in 2014 to a felony count of voluntary manslaughter for Deanda’s slaying and is scheduled to be sentenced on Nov. 17 in the Los Angeles County Superior Court’s Pomona Branch. Lule drove Mata to rival gang territory in the 13200 block of Francisquito Avenue in Baldwin Park. Baldwin Park in the predawn hours of Dec. 24, district attorney’s officials said in a written statement. “Once there, Mata exited the car and walked up to a house where David Deanda Jr., 31 was standing in the driveway,” according to the statement. “Mata then fatally shot Deanda in the torso before fleeing the scene, the prosecutor added. Mata exited the car and walked up to Deanda Jr. who was standing in the driveway of a residence, Barkhurst said. Mata then fatally shot Deanda in the torso before fleeing the scene. A third defendant, then-27-year-old Christina Montenegro, was initially charged in connection with the 2012 shooting, but the charges were ultimately dropped. Deanda, who worked as a welder, was survived by his wife, a son, a daughter and a stepdaughter, according to family. In April 2012, Mata shot at the home of another rival gang member in Baldwin Park, and was found guilty of attempted murder and possession of a firearm by a felon in a 2015 trial. He was sentenced to life, plus 25 years, in state prison for those crimes. But the jury deadlocked on the murder charge stemming from Deanda’s fatal shooting, leading to a second trial. Following his initial arrest in May of 2012 in connection with the Baldwin Park slaying, Mata spent more than a year on the lam after he as accidentally released due to a Los Angeles County Sheriff’s Department clerical error. He was re-captured in April of 2014 in Mexico and returned to the U.S. to face justice. Following Tuesday’s sentencing hearing, Mata is now serving a total sentence of life in prison, plus 111 years to life in prison. SAN GABRIEL >> Coroner’s officials have identified a 38-year-old Rosemead man who was fatally shot in the back during a gang-related dispute in South San Gabriel last week. John Daniel Pollerana died at a hospital about 45 minutes after Thursday’s 11:47 p.m. shooting in the 1600 block of Del Mar Avenue, in the unincorporated county area, Los Angeles County Department of Medical Examiner-Coroner officials said. He was among three men who became involved in an altercation with fourth other men in the parking lot of a motel, Lt. Jose Mendoza of the Los Angeles County sheriff’s Homicide Bureau said. The dispute was believed to be gang-related. One of the four men pulled a handgun and shot the victim in the back, according to sheriff’s and coroner’s officials. One of the attackers drove away from the shooting scene in a white, four-door sedan, Mendoza said. The other three suspects fled the area on foot. Deputies quickly found one suspect — later identified as 31-year-old Juan Luis Colin of Bell Gardens — on foot in the area and detained him, officials said. Juan Luis Colin, 31, of Bell Gardens, was treated for cuts to his arms he suffered while fleeing from deputies through backyards before being booked on suspicion of murder, Mendoza said. Investigators determined Pollerana was staying at the motel along with two friends, Mendoza said. The group had ties to a local street gang. The four suspects, who are tied to an East Los Angeles street gang, had been staying in another room at the motel, he said. The groups encountered one another in the parking lot and an argument ensued before “at least one” of the suspects pulled a handgun and opened fire. Pollerana was mortally wounded. Another man who was with him suffered a grazing wound, it was later determined. The three additional suspects remained at large Wednesday. According to county booking records, Colin was scheduled to appear in the El Monte branch of Los Angeles County Superior Court on Monday for an arraignment hearing. He was being held in lieu of $2 million bail.